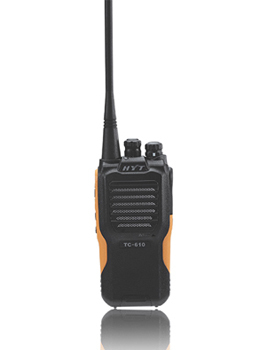 The HYT TC-610 is an Analog Two way radio that’s 4.68” tall and weighs 9.7oz. With 16 channels and superior, crisp 1 Watt of speaker audio for noisy environments. This user friendly, rugged two way radio makes communications a simple process. The TC-610’s frequency range allows Commercial frequencies to be programmed. Covering the UHF 450-470Mhz with 4 watts and the VHF 136-174Mhz band with 5 watts, the TC-610 can be used in direct or repeater mode. The TC-610 meets the IP66 rating. This rating identifies the radios as being fully protected against dust and streaming water from any direction. The IP66 protection rating makes the TC-610 the ideal communications device for wet, dusty, rugged environments. Large, top mounted channel select and on/off/ volume control knobs are large enough to be used while wearing gloves. The TC-610 ships with belt clip, antenna, wrist strap and a desk top charger for convenience. A 6-Unit charger is also available allowing multiple units to charge from one AC outlet. With a standard 2000Mah lion capacity battery and based on the 5-5-90 standard, the radio can provide up to 14 hours of communications. Its compact yet rugged design Meets MIL-STD-810 C/D/E/F standards and is IP66 rated against Dust and Streaming water. The TC-610’s size, features and ruggedness offers Hospitals, shopping centers, schools, Construction companies, churches and restaurants a fully featured two way radio that is palm sized and can provide years of service in those demanding environments. The TC-610 is covered by a standard 2 year Manufacturer’s warranty which can be increased to 3 years with the optional 1 year extension. The TC-610 is comparable to Motorola Cp185, Cp200, HT750. Icom IC-F3001. Kenwood TK2402/3402.